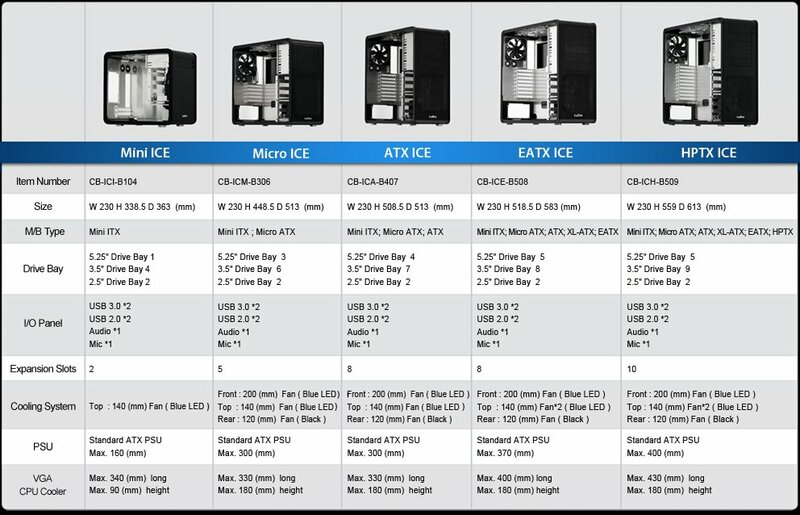 Cubitek introduced five ICE series cases, from Mini-ITX to HPTX. Cubitek, a manufacturer of PC chassis, is pleased to announce their new line of chassis – ICE Series. Including 5 new models, these ICE Series chassis using a 2.5(mm) extrusion aluminum construction are stronger than standard aluminum cases, yet thinner than other extrusion aluminum chassis on the market. This unique build gives ICE Series a strong frame while still keeping a more lightweight design. The sturdy extrusion aluminum frame translates to reduced vibration. The hard drives inside the cage body are mounted with thick rubber rings that simply slide into the drive bay and prevent vibration noise. Along with vibration reducing side panels with rubber strips, the ICE Series minimizes vibration-induced noise with its solid form. The extrusion aluminum build dissipates heat faster than steel built chassis keeping your system cool. From mATX on up, all models feature a large 200(mm) fan in the front as well as a 140(mm) on the top and a 120(mm) fan in the back. The well-placed fans and interior layout keep your hardware at optimum system temperatures. The motherboard tray is well-designed with large cut-outs for CPU cooler mounting and plenty of rubber protected holes to guide cables to the 0.7” (19 (mm) ) space behind the motherboard tray. The u-shaped clips behind the motherboard allow you to easily fasten you wires ,making cable management easy and keeping your system neat and organized. All five models of the ICE Series feature an easy-to-reach I/O panel on the top of the chassis including: 2x USB 3.0 ports, 2x USB 2.0 ports, and gold-plated audio input/output with anti-jamming capabilities.